Just one more week until we are back in America! Never before have I been so excited about the luxury of having running water all day long. Of course, I haven't before been in a place where the water is off about 18 out of 24 hours. Imagine being able to flush the toilet and wash your hands any time! Juliana can paint and play in the dirt and do messy activities because we can actually clean her up afterward. Kevin can take a shower when he gets back from playing sports all hot and sweaty. We won't have to plan ahead to get the laundry and dishes done in the short “water windows.” If our child should throw up in the middle of the night, we can actually clean her up (unlike last week when we had no water). After a couple of months of this, we are getting better at filling up basins and jugs so we can wash hands and flush toilets during the day, but if we forget it's a real pain. Usually we have water from 7-8am, 12-1pm, 6-7pm, and about 9-11pm. We have finally been remembering to fill up Juliana's tub with water before dinnertime so we can give her a bath before bed. After playing outside every afternoon in the heat and dirt, she definitely needs it! Laundry is trickier. I have to remember to put it in as soon as the water comes on so it can finish before the water turns off again. Our washer may be small but it takes forever to fill up! Fortunately, it's so dry here that we could hang up laundry at 9pm and it would probably be dry by bedtime. We live in on the edge of the desert, so if our lack of water was due to actual water shortage, I wouldn't mind it so much. Saving water is a good thing, and nothing helps water conservation like not having any water to waste! However, our water is not off because of water conservation. It is only consistently off during the springtime, and it's because they are busy flooding the grass. 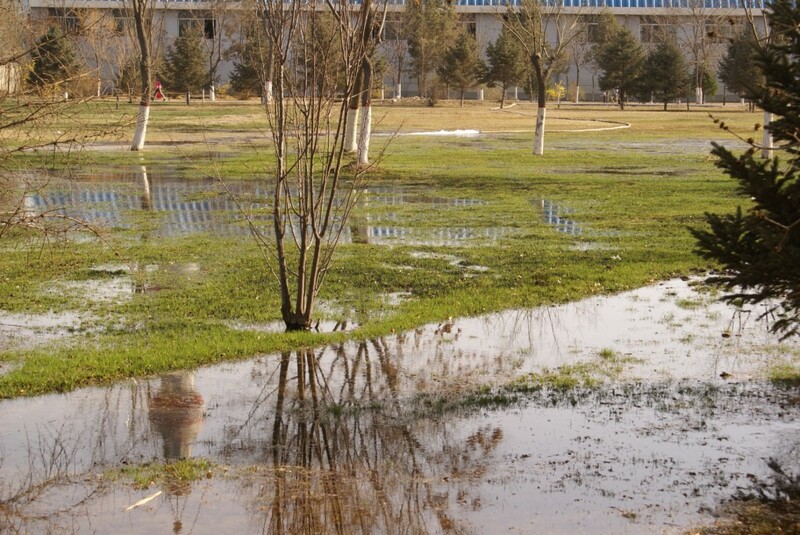 Not watering – flooding. The typical “watering” method seems to be: Place an extra-large hose on one spot in the ground. Eight hours later, move hose to a new location. It makes no sense to me. 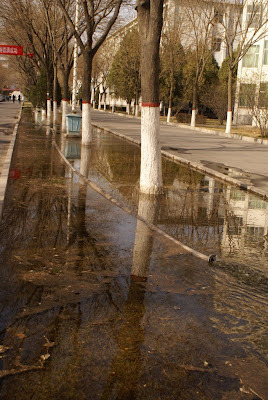 And yes, sometimes when I see all that nice water making a mess out of the ground, puddling on the sidewalk, and forming lovely mud playgrounds for children, I'm a little bitter that we can't wash our hands. Sometimes I imagine what my life would be like in an alternate reality. I don't feel discontent with this life; I just wonder what life could be like in another place and another situation. I think I would be a hippie. Some sort of Laura Ingles Wilder meets Madeliene L'Engle's Austin family. We live in a big, old farmhouse in not quite the middle of no-where Kentucky, but close enough that there are fields of cows (not ours) and crops (not tobacco) all around. The house is weathered and comfortable. All of the windows are open, since it's springtime, and there is a fabulous breeze. The house is surrounded by a big porch overlooking rustling trees and open pastures. 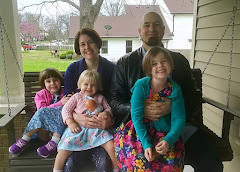 We have about five kids, all of whom were born at home. It doesn't seem like too many because they can roam around all over and we never have to travel by airplane. I do very wholesome things like baking bread, sewing clothes, and canning. We have a giant garden full of vegetables and flowers that are actually growing. Of course the super helpful children take part in gardening and cooking and all those other wholesome tasks. We have a big old tractor but no livestock. Maybe a few chickens. Far away from the house and not very smelly. A nice dog and a couple of cats that wander in and out but stay remarkably clean. I get up at sunrise to enjoy coffee on the porch while it's still quiet, unaccountably a morning person. I cook all kinds of healthy, from-scratch meals, and we don't eat any processed food except boxed mac and cheese because it's irreplaceable. We all run around barefoot, and we are never fashionable. I probably home-school. We read books under big trees and catch fireflies after dark. We are so relaxed that we may not even have clocks in our home...we just go by the sun and the seasons. It's all very earthy. In real life I live in a sixth floor apartment in a Chinese city. There are plenty of (live) chickens at the market waiting to be eaten, but that's about all in the way of livestock. I can't really imagine having five kids, and while I find home-birth intriguing, I was quite satisfied with my hospital/midwife birth. I don't really like to cook that much, Juliana has yet to turn me into a morning person, and I always like to know what time it is. But have started making bread again, a remarkably simple recipe from my sister Becky that turns out well even in my small China oven. We have a pet cat, puppy, bunny, kiwi bird, and several giraffes – they just all happen to be stuffed. I will likely home-school, since we'll be living in China, and I'll probably mostly enjoy it. I have one house plant which I have kept alive for over a month. And the not-fashionable part seems to be working out quite well. So I'll just take what I've got and enjoy the rest in my imagination. This recipe makes 2 loaves so you can eat one and freeze one, but it can easily be halved if desired. In a large bowl, dissolve the sugar in warm water, and then stir in yeast. Allow to proof until yeast resembles a creamy foam. Mix salt and oil into the yeast mixture. Mix in flour one cup at a time. Knead dough on a lightly floured surface until smooth. Place in a well oiled bowl and turn dough to coat. Cover with a damp cloth. Allow to rise until doubled in bulk, about one hour. Punch dough down. Knead for a few minutes and divide in half. Shape into loaves and place into two well oiled 9”x5” loaf pans. Allow to rise for 30 minutes, or until dough has risen 1” above pans. Bake at 350˚F for 30 minutes. * Whole Wheat: Substitute up to 2 cups of whole wheat flour. Add 1 tbsp honey with salt and oil. *Add a bit of wheat germ (I never actually measure). “Don't run into the street” seems to be one of those basic childhood rules. It's an unquestionably important issues to have squared away, but it is also one that I find rather perplexing. It seems very sensible to tell Juliana not to run into the street; I just have to figure out first what “street” means. Obviously I don't let Juliana run around near the big road outside our campus that is filled with cars, buses, taxis, bicycles, and motorbikes. I usually let Juliana walk on the sidewalk, but there are probably more people walking on the road than on the sidewalk. The sidewalk, which is partly for walking but is also where you get your bike repaired; get your shoes repaired; hang out and drink yogurt; buy newspapers, snacks, milk, fruit, and honey. It is the parking lot for small shops and an alternate bicycle route. What about the little roadway going through campus? At some parts of the day it is mainly a walkway for students going to and from their dorms, grandparents walking with their young children, plus a few bicycles and motorbikes. During these times I let Juliana walk on the road because pedestrians outnumber drivers and a lot of other toddlers on the road as well. In the evening, the road is busy with bicycles, motorbikes, and cars – as well as lots of pedestrians. Even though there are lots of children walking home from school and preschoolers skipping beside their parents, I don't let Juliana walk on the road at this time because it's so busy. What percentage of vehicle traffic vs. pedestrians turns a walkway into a road? What about the area outside our apartment where little children often gather to play? Toddlers run about and ride around on their little toy cars. Babies hang out with their grandmas. School children kick around balls. It's also directly in front of the bike-shed, so bikes and motorbikes often come through. It is also a parking lot for the occasional delivery truck or car stopping by the small store next door. Perhaps Juliana will be confused that sometimes she is allowed to walk on the road and other times not. 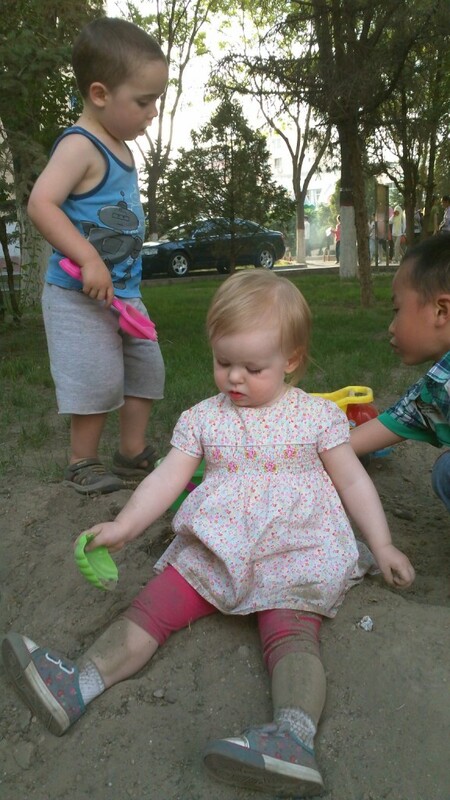 The again, she's grown up in China, so she might already have a much better grasp on the flexibility of life here. The lines between street, sidewalk, parking lot, store, and play area all blend together, and I'm sure it doesn't bother her in the least.